One can never get tired of stuffed peppers – there are so many incredible ingredients to stuff them with! Peppers can be filled with chicken, pork, mushrooms, eggs, spinach, bacon, tomatoes, ham, sausage; you get the point. On occasion we will even have stuffed peppers for breakfast. But, we do love them for dinner too, and these Tex-Mex stuffed peppers are guaranteed to please everyone around the table. It is the amazing combination of oregano, smoked paprika, ground cumin and coriander that entices people to grab a fork and dig in. 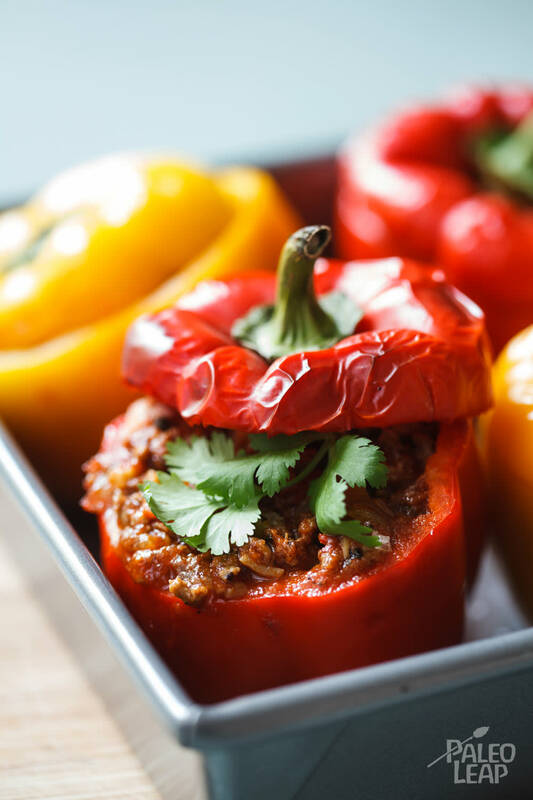 Now that you are convinced that dinner will be excellent, clean out those bell peppers, being careful not to slice through the bottom and get to cooking that ground beef mixture with tomatoes and spices. Any ground meat will do nicely for stuffing peppers, just make sure there is a sufficient amount of guilt-free fat, as that is where the flavor is at. The chopped tomatoes are a must too, it is expected in a “taco” mix, and it holds everything together – just as you hold your family together when you cook and eat at the table as one. That being said, Tex-Mex peppers are perfect for a family meal, friends, co-workers and neighbors included. Stuffed peppers are meant for sharing, so invite a few people over and dine together. If your gathering is turning into a party, then make sure to add a Tex-Mex turkey skillet to the menu, along with party drinks of course. Melt the coconut oil in a large pan and fry the onion until soft and translucent with the carrot and celery. Add the ground beef and allow the meat to brown. Add the garlic, bay leaf and spices; stir to combine. Add the tomatoes, tomato paste and mushrooms, then season to taste. Allow to cook for 15-20 minutes over low-medium heat until the beef is cooked through. Slice the tops of the bell peppers and scoop out the seeds. Fill each pepper with the ground beef mixture then place their tops back on and place in the oven. Allow to bake for 10-15 minutes until the peppers are cooked, but still holding their shape.